During the 1970s, when there were actually talks about closing Radio City Music Hall, the New York Times architectural critic Paul Goldberger hailed the building as "a masterpiece of design, the city's true shrine of Art Deco." And even now, Goldberger’s compliment still holds true. With all due respect to the Chrysler Building, the Empire State Building, and the Waldorf Astoria New York, no other interior in Manhattan comes close to embodying that early modernist flair as spectacularly as Radio City. Where else would you find elevators ornamented by Edward Trumbull’s Bakelite-accented rondels of satyrs and nymphs? Or a grand staircase that comes with a 40-foot high painting like Ezra Winter’s mythic "The Fountain of Youth," the tallest mural at Rockefeller Center? Or theater doors that double as a gallery for Rene Chambellan’s 66 bronze low-reliefs that, in turn, serve as a historic survey of world theater? Part of the credit goes to interior designer Donald Deskey, the man responsible for coordinating (and occasionally contributing to) the furnishings and decorations inside Radio City. And part goes to Abby Aldrich Rockefeller, co-founder of MoMA and wife of the complex’s namesake developer, John D. Rockefeller Jr. "I think she really swayed them into it," says art historian Christine Roussel regarding the choice to hire Deskey. According to Roussel, who also oversees the Rockefeller Center archives, Mrs. Rockefeller was always "looking for experimentation" and for artworks that were "vital and exciting and new." Radio City’s artwork is hardly restricted to murals and furnishings either. Particularly memorable is a trio of aluminum sculptures: Robert Laurent’s "Girl and Goose," Gwen Lux’s "Eve" and William Zorach’s "Dancing Figure." Roussel notes that the pieces stirred up some controversy when Rockettes mastermind Samuel "Roxy" Rothafel proclaimed that the nudes "were lascivioius works of art and should be removed immediately." But as she sagely adds, "Anyone who curated the Rockettes wouldn’t have considered that lascivious." Press was generated, and that was what Roxy likely hoped. Far from shocking the public, "Dancing Figure" has become the most popular sculpture to photograph in the building, according to a recent tour guide. 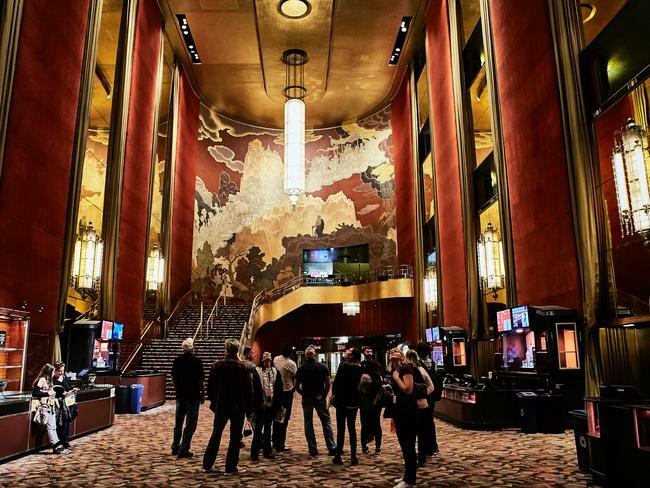 Regarding the Radio City Stage Door Tour, it's a great way to learn the ins and outs (and subterranean secrets) of the theater, and can be combined with a Christmas Spectacular performance during the holidays. Whether the passionate, well-informed tour guides are leading you through the imagery of Ruth Reeves’ jazzy carpet in the Grand Foyer, introducing you to a Rockette for an informal Q&A, or taking you inside Roxy’s period-perfect furnished apartment upstairs, you'll gain a new appreciation for the legendary venue. Indeed, the 90-minute tour provides a glimpse of Radio City that the general public can’t normally see, including the massive hydraulic system under the stage, and a hallway of etched glass portraits of performers who have sold out the venue, like Whitney Houston, Bette Midler and Prince. The Stage Door Tour runs year-round from 9:30am to 5pm daily. Use the code "ONLINE" for a discount on adult tickets, or call 212-247-4777 to make reservations.